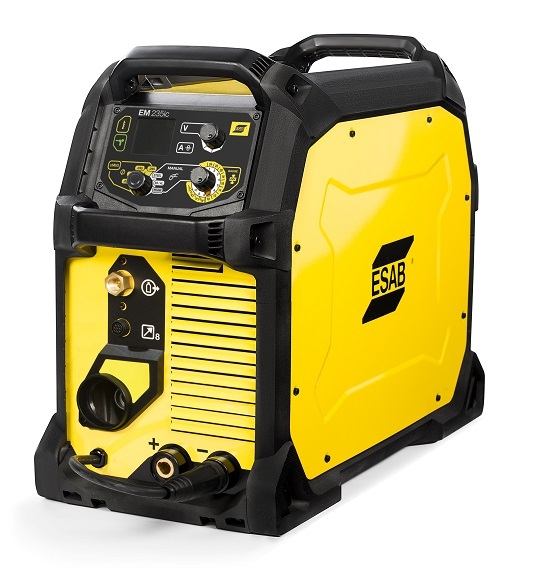 Introducing Rebel EM 235ic - the next level Rebel welding machine for MIG welding performance in a portable package. When it comes to getting around and getting work done, Rebel EM 235ic is second to none. It is the most mobile welder in its class and has the power and performance to crush even the most demanding jobs. Unmatched Portability – weighing in at 53 lbs. (24 kg) with dual voltage capability and 4 handle roll cage. Detach the Rebel EM 235ic from its cart and tackle any job around the shop or out at the job site. Power to Perform – have the confidence with Rebel EM 235ic to run the full range of .035 in. (0.9 mm) wire – short arc and spray transfer. Also up to .045 in. (1.2 mm) solid wire and up to .052 in. (1.4 mm) cored wire. sMIG Technology - innovative “smart-MIG” feature that dynamically monitors the arc characteristics ultimately adapting to your technique resulting in a smooth, stable arc. Set wire diameter and plate thickness and you are ready to weld. Includes power supply, Tweco SprayMaster 250 MIG gun, Victor argon flowmeter regulator, 12.5 ft. (3.8 m) hose, return clamp with leads, drive rolls and contact tips, .035 in. (0.9 mm) wire, power adapter, and operator’s manual. Rebel EM 235ic with Cart package also includes single cylinder cart.